We recently published our Product Evaluation Report on Desk.com, Salesforce’s customer service offering for small and mid-sized businesses. “Desk” is a very attractive offering with broad and deep capabilities. It earns good grades on our Customer Service Report Card, including Exceeds Requirements grades in Knowledge Management, Customer Service Integration, and Company Viability. We’re confident that this report provides input and guidance to analysts in their efforts to evaluate, compare, and select those customer service products, and we know that it provides product assessment and product planning input for its product managers. Technology analysts and product managers are the primary audiences for our reports. We research and write to help exactly these roles. Like all of our Product Evaluation Reports about customer service products that include multiple apps—case management, knowledge management, web self-service, communities, and social customer service—it’s a big report, more than 60 pages. Big is good. It’s their depth and detail that makes them so. Our research for them always includes studying a product’s licensed admin, user, and, when accessible, developer documentation, the manuals or online help files that come with a product. We read the patents or patent applications that are a product’s technology foundation. Whenever offered, we deploy and use the products. (We took the free 30-day trial of Desk.) We’ll watch suppliers’ demonstrations, but we rely on the actual product and its underlying technologies. On the other hand, we’ve recently been hearing from some, especially product marketers when they’re charged to review report drafts (We never publish without the supplier’s review. ), that the reports are too big. Okay. Point taken. Perhaps, tt is time to update our Product Evaluation Framework, the report outline, to produce shorter, more actionable reports, reports with no less depth and detail but reports with less descriptive content and more salient analytic content. It’s also time to tighten up our content. Our Product Evaluation Reports have had two main parts: Customer Service Best Fit and Customer Service Technologies. 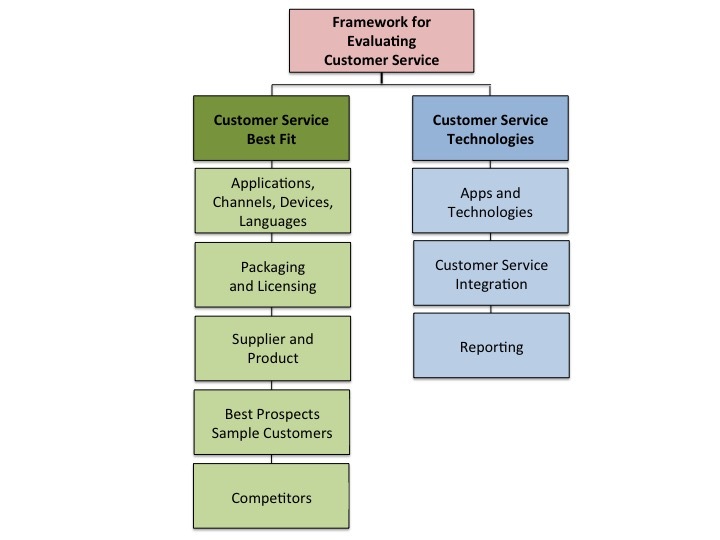 Customer Service Best fit “presents information and analysis that classifies and describes customer service software products…speed(ing) evaluation and selection by presenting easy to evaluate characteristics that can quickly qualify an offering.” Customer Service Technologies examine the implementations of a product’s customer service applications and their foundation technologies as well as its integration and reporting and analysis capabilities. Here’s the reports’ depth and detail (and most of the content). Going forward, we’ll continue with this organization. Applications, Channels, Devices, Languages are lists of key product characteristics, characteristics that quickly qualify a product for deeper consideration. More specifically, applications are the sets of customer service capabilities “in the box” with the product—case management, knowledge management, and social customer service, for example. Channels are assisted-service, self-service, and social. We list apps within supported channels to show how what’s in the box may be deployed. Devices are the browsers and mobile devices the product supports for internal users and for end customers. Languages are two lists: one for the languages in which the product deploys and supports for its administration and internal users and one for the languages it supports for end customers. Packaging and Licensing presents how the supplier offers the product, the fees that it charges for the offerings, and the consulting services available and/or necessary to help licensees deploy the offerings. Supplier and Product present high level assessments of the supplier’s and the product’s viability. For the supplier, we present history, ownership, staffing, financial performance, and customer growth. For the product, we present history, current development approach, release cycle, and future plans. Best Prospects and Sample Customers are lists of the target markets for the product—the industries, business sizes, and geographies wherein the product best fits. This section also contains the current customer base for the product, a list of typical/sample customers within those target markets and, if possible, presents screen shots of their deployments. Competition lists the product’s closest competitors, its best alternatives. We’ll also include a bit of analysis explaining what make them the best alternatives and where the subject product has differentiators. Customer Service Technologies is our key value-add and most significant differentiator of our Product Evaluation Reports. It’s why you should read our reports, but, as we mentioned, it’s also the main reason why they’re big. We’ve spent years developing and refining the criteria of our Evaluation Framework. They criteria are the results of continuing work with customer service products and technologies and our complementary work the people who are product’s prospects, licensees, suppliers, and competitors. We’re confident that we evaluate the technologies of customer service products by the most important, relevant, and actionable criteria. Our approach creates common, supplier-independent and product-independent analyses. These analyses enable the evaluation and comparison of similar customer service products and results in faster and lower risk selection of a product that best fits a set of requirements. Too much narrative and analysis has crept into Tables. We’ll make sure that Tables are bulleted lists with little narrative and no analysis. Evaluation criteria have become too broad. We’ve been including detailed descriptions and analyses of related and supported resources along with resources that’s the focus of the evaluation. For example, when we describe and analyze the details of a case model, we’ll not also describe and analyze the details of user and customer models. Rather we’ll just describe the relationship between the resources. Our analyses will have three sections. The first will summarize what’s best about a product. The second will present additional description and analysis where Table content needs further examination. The third will be “Room for Improvement,” areas where the product is limited. This approach will make the reports more actionable and more readable as well as shorter. In reporting, we’ll stop examining instrumentation, the collection and logging of the data that serves as report input. The presence (or absence) of reports about the usage and performance of customer service resources is really what matters. So, we’ll call the criterion “Reporting” and we’ll list the predefined reports packaged with a product in a Table. We’ll discuss missing reports and issues in instrumentation in our analysis. Our Product Evaluation Report about Microsoft Dynamics CRM Online Service will be the first to be written on the streamlined Framework. Expect it in the next several weeks. Its Customer Service Best Fit section really is smaller. Each of its Customer Service Technologies sections is smaller, too, more readable and more actionable as well. Here’s the graphic of our Product Evaluation Framework, reflecting the changes that we’ve described in this post. Please let us know if these changes make sense to you and please let us know if the new versions of the Product Evaluation Reports that leverage them really are more readable and more actionable. This entry was posted in Customer Service, Evaluation Framework and tagged assisted service, case management, contact center, customer self-service, customer service, knowledge management, self-service, social customer service, virtual assisted-service by mitchkramer. Bookmark the permalink.